I took these from Jackson, GA (USA), where we were staying this week with friends (all hand-held). when I wished I had had a tripod! Now we're up in the Blue Ridge Mountains of North Georgia with my kids. Ginnie Hart: That's very kind of you, Peter. Thanks. A bloody good sight. Happened at sunset for me. Ginnie Hart: It was great fun to see, Michael, wasn't it! Ginnie Hart: Thank you, Jacquelyn. We both felt very lucky. Great shots, Ginnie, we had clouds unfortunately. Ginnie Hart: Thanks, Frank. We felt very fortunate. Ginnie Hart: Thank you, dear Robin. You WILL see more. HA! it was low on the horizon and quite hazy in Singapore, Ginnie. top left is a smashing shot. what tripod? Ginnie Hart: We felt very lucky, Ayush. Thank you. Ginnie Hart: I love my little magical camera, Lisl, as you know. THANK YOU! Nice and interesting presentation Ginnie. I like the last. Ginnie Hart: Merci, Marie. We were so excited the kids were clear. Well done for making the effort Ginnie! 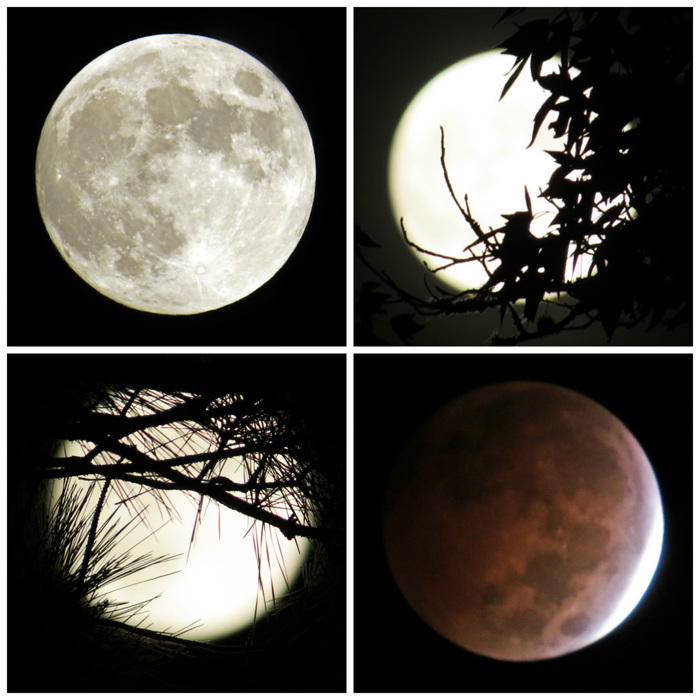 Ginnie Hart: It seemed a sin to not try for the lunar eclipse, Chris. . So glad we weren't disappointed. There has been a rash of people in Droitwich taking pictures of the moon and posting them on facebook. None are a patch on these! Ginnie Hart: You know how to make my day, Bill. Thank you. I like the fact that your friends were all hand-held; just as it should be A lovely presentation. Theone bottom right remind me of an eyeball. Ginnie Hart: My "friends" we're quite cooperative, Alan, which pleased me very much. Thank you very much. Impressive sequence, have a happy time in the mountains with the family. Ginnie Hart: Many kind thanks, Martin. So far so good! Ginnie Hart: Most kind of you, Chad. We feel very lucky that the skies were clear. Very nice for handheld. I see a witch in the one top right. Ginnie Hart: Thanks, Mary. Someone on Facebook also saw a witch, so you're in good company. I bet you were thrilled to get to see and capture this event, Ginnie. The results are magnificent and so well presented in this collage. Unfortunately we had clouds. Enjoy your time in the Blue Ridge Mountains; must be beautiful there. Ginnie Hart: I was indeed a very happy camper, Beverly. Thank you. And right now we're totally enjoying the mountains, though it's a bit earlier and hotter than our normal time. One can moon over this posting for some time. Happy hunting for more great quality pictures. Ginnie Hart: Good play on words, Louis. . Thanks! Ginnie Hart: Thank you, Brian. It's so funny because we just visited the Laurel and Hardy Museum in Harlem, GA, this week. WOW. c'est magnifique, les 4 prises sont sublimes. These are just incredible pictures. It was an amazing sight. The moon is intriguing, every time it shows a different face. Ginnie Hart: We were so lucky to have clear skies both in the evening and the morning. Thanks for sharing it with me! Fine shots, Ginnie - excellent for hand-held! Ginnie Hart: Many thanks, Anne. We were so lucky to have such clear skies! Ginnie Hart: Thank YOU, Pat. Ginnie Hart: Having my new Powershot camera has made all the difference in the world, Cherry. I never could take good pics of the moon with my DSLR. Interesting, right? Ginnie Hart: Both Astrid and I have a tripod back in the Netherlands, Elaine, but I hardly ever use it. It's good for such things as the eclipse, but it is as it is. I was glad I was able to get what I did. It's wonderful to see these, Ginnie. I was also photographing the moon that night (not as successfully and we couldn't see the eclipse here). In fact I did a whole Full Moon Ceremony on my house (as is my wont). It involved a singing bowl and lots of crystals. Then I went outside and admired the moon and tried to photograph it, and as I went back in I spotted my neighbour at her back door. I'm not sure she was moon spotting. I think she was looking at me with amazement and thinking I'd gone mad! I love the way when it's eclipsed the moon goes pink and for once you can see its roundness. Ginnie Hart: I would have loved being your neighbor, Penny, watching your every move!